When it comes to design, there don’t have to be sparkly bells and whistles to tell a great story. Case in point: Phillips and Chad’s wedding invitation (which, by the way, wins the award for best names on an invitation ever). Simple and elegant in charcoal and white with rounded corners, the couple chose it because of its resemblance to a hardcover book. “We love to read,” Phillips explained, “and both families place a priority on education.” The Alabama bride and groom worked with Emily at Kyle Fine Stationery to create the look. Here, they talk about the importance of knowing what you like (and don’t like) as well as being open to unexpected opinions (we’re looking at you, grooms). 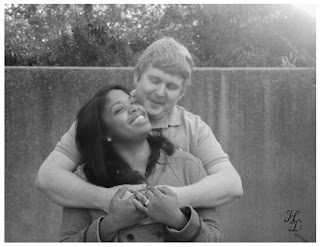 Tell me how you and your fiancé met, and how did he propose? Chad and I met in Alabama Action, which was a service-learning course at The University of Alabama. We were friends for a year before we started dating. According to all of the friends and family who knew before me, Chad had to adjust his proposal plan multiple times for various reasons. But right before he graduated with his Ph.D., he had to travel to Germany with his dissertation chair. He tricked me into thinking he'd waited until the morning of the trip to pack his bags and needed me to double check his suitcase to make sure he wasn't leaving out anything important. As I stepped in the door to head for the suitcase, he cut me off and dropped to one knee. 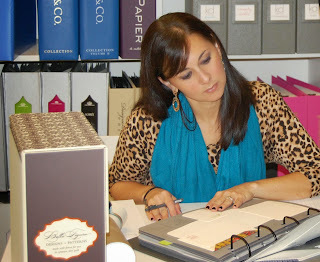 Tell me about the process of choosing your wedding invitations—did you have something in mind going into your first appointment and did that change? I had nothing in mind when choosing wedding invitations beyond wanting the families to enjoy them. I'd looked at over 400 invitation templates online and seen different elements I liked, but nothing enough to actually order a sample or look at it a second time. My Maid of Honor finally begged me to go into a brick and mortar store to actually feel paper and discuss customization. After three books and 30 minutes, I left with eight strong options to share with my parents, Chad and his parents. Chad and my dad were actually the least interested in helping pick out the details, but they turned out to be the most vocal about them! It was a funny deviation from normal to hear my future husband stop watching ESPN to ask we make sure the corners were rounded. We ended up with an invitation suite that most resembled, to us, a classic hardback book. This detail was great, because we love to read and both families place a priority on education. 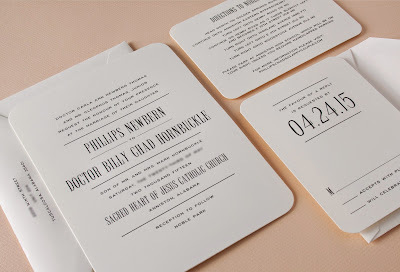 The font was large enough for older family to read, and the dark grey engraving was a beautiful way to make it stand out from other similarly set invitations. I was not expecting Chad to zero in on the details for the invitation: the rounded corners, the width of the margins and so forth. Plan in advance what you would like for it to say. Chad had recently earned his Ph.D. so we'd still been excited for it but not yet discussed whether he'd want to include it. We ended up doing so, but having talked about it beforehand would have made the process a little smoother. What was the moment you were most looking forward to on your wedding day? Hearing the priest introduce us as husband and wife, and letting it sink in that all that's left to do is enjoy all the results of several months' planning! Tell me about your first meeting with this bride and about the process you went through to get to the final decision. Phillips was great to work with! The first day she came in we didn’t have any appointment time slots for that day but we were able to let her look through some of our albums. She made an appointment immediately for the next week. At the appointment Phillips already knew what her family and fiancé liked and we just needed to get the okay on pricing, wording, etc. Because of her busy work schedule we were able to finish the process over email and she was always so prompt with her replies and responses. After we go over the date of the wedding and location, the first question I like to ask is, “When you picture your wedding invitation, what do you envision?” It’s a good way to break the ice and get the bride talking about the feel and tone of her wedding. Then you usually have a good idea of the style she is going for and can direct her to the right invitation suite. What are some big invitation design trends you're seeing these days? One of the biggest trends we are seeing is a custom duogram for the couple. We are able to design these in-house for a fee or we go with one of the duograms our vendors like Crane and William Arthur already have in their design guides. Brides are using them almost like a wedding logo. It can be used on the invitations, cups, napkins, favors, programs and afterwards on their stationery. We love for brides to come in with photos or samples of what they like or even don’t like. We ask them to allow two hours for the appointment. This helps them not feel rushed and to make the most of their time with us. Bring your fiancé, mother or a bridesmaid, whoever you feel will help you make some definite decisions. It also helps to have a ballpark on how many invitations you may need for proper pricing (number of addresses not people). We definitely feel like because the economy has gotten better in the last five years that brides have been more willing to invest in their wedding wardrobe. Brides now are paying a little more attention to the higher-end details such as thicker paper, edge painting and beveled edges. One of the details is also using calligraphers to pen their invitation suite. Today’s brides want a unique lettering style exclusive to their wedding suite and that can be easily obtained with a calligrapher. The bride herself is different in that she is more involved in the decision-making and has a clearer idea of what she wants. She is the main contact versus her mother or other family member. Maybe this is because the bride is a little older and women are waiting a little longer to get married.